VYAPAM Recruitment department is going to filling up the vacant positions of High School Teacher Posts. Latest Govt jobs in MP for High School Teacher Posts. 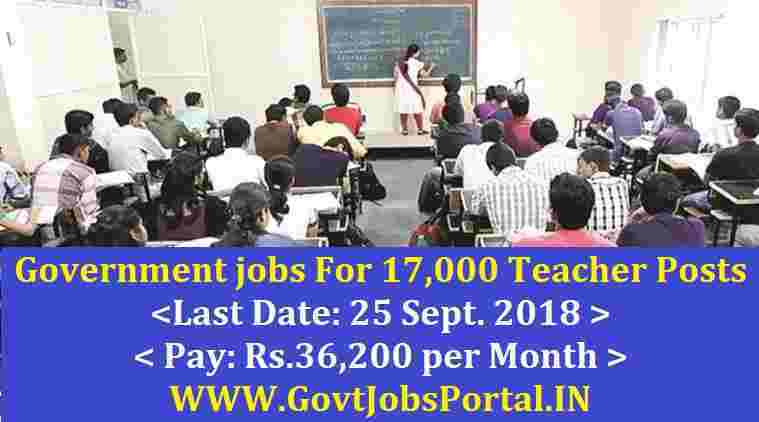 An official notification is out on the official website of VYAPAM Recruitment department in which they are inviting all eligible Indian candidates to apply these MP Government jobs for High school teacher posts. There are total 17,000 vacancies which are going to filled up through this VYAPAM Recruitment process. More information about these Government jobs in MP state is given below in this article. Read the complete article carefully before applying online for this recruitment process. What are the Eligibility Criteria for applying this VYAPAM Recruitment? Education: All applicants who have passed in their Post-Graduation degree in Second class percentage and also have done B.Ed. From a well-recognized university can apply for these Government jobs. Age Bond: Indian applicants having age in between 21 years to 40 years can apply these MP Govt jobs. Paying Method: All applicants have to pay the application fee through the online methods, the various online method for payment are as follow: “Debit Card, Credit Card, Net Banking MP Online KIOSK Fee Mode”. There is no other method for the payment of application fee. All those who applied for these MP Government jobs will be selected on the basis of their performance in the written examination. VYAPAM Recruitment decide to conduct a written examination on 29th Dec. 2018 for the selection of the candidates who are going to applied for these Govt jobs in MP. Procedure for Applying These MP Government jobs? Those who satisfied the educational and age criteria can apply for this recruitment process through ONLINE method. There is no other way for applying these Government jobs in India. The link for applying will be activated on 11th Sept. 2018 and the link will remain activated up to 25th Sept. 2018. You have to apply online between these dates. 11TH Sept. 2018 is the opening Date to apply. 25th Sept. 2018 is the Last Date to apply. 29th Dec. 2018 is the Exam Date.